The designation Su-37 was first used to market a truely multi-role version of the Su-35 (Su-27M) to the United Arab Emirates (UAE) air force. The Su-37MR (MR for multi-role) that was offered would have French-built instrumentation equipment and a number of changes in the avionics. Sukhoi Design Bureau and KnAAPO export company selected the series produced T10M-11 (Su-27M pre-production test aircraft) for conversion, which had already been testing the multi-mode N011M phased array radar. However the UAE preferred the Mirage 2000-9 and it was decided to use the T10M-11 as flying test-bed for the engine thrust vector control (TVC) system. The Su-37 designation was retained. The TVC system enables the aircraft to direct its thrust produced by the AL-31F engines in a different angle than the flight path on the vertical axis. In high angles of attack, normally an aircraft would stall and the pilot would lose control because of the disrupted airflow over the control surfaces. Also at very low airspeeds, the control surfaces no longer function effectively. With TVC the aircraft can still be controlled under these circumstances by using the engines thrust instead of the airflow. 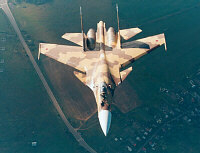 The new Su-37 made its first flight fitted with the TVC engines on 2 April 1996 by Sukhoi's test pilot Yevgeny Frolov. The aircraft was nicknamed Terminator. The Su-37's TVC system is integrated into the aircraft's fly-by-wire system, giving the aircraft controllability at beyond-critical angles of attack and near-zero speeds. The Su-37 was able of performing aerobatics unmatched by any contemporary fighter. Examples include vertical somersault while retaining the flight path (Frolov's chakra), forced tight radius turns, controlled spin. This super-manoeuvrability would give the Su-37 an edge in dogfights with other aircraft. It also stunned the public at the Farnborough airshow in September 1996, Le Bourget in June 1997 and MAKS in August of 1997. The Su-37 engine nozzles swivelled only vertically (2D vectoring). Lyulka-Saturn further developed the vectoring nozzle which resulted in the AL-31FP thrust vector control engines capable of moving in both vertical and horizontal axes (3D vectoring). 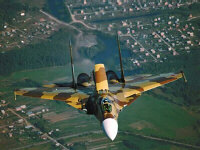 The AL-31FP engine was offered to foreign customers on more advanced developments of the Su-30MK such as the Su-30MKI of the Indian Air Force and as an option for customized versions of the earlier Su-35 'Super' Flanker. The Su-37's life ended when T10M-11 (serial 711) was lost in a crash on flying a ferry flight in Russia. The aircraft was not fitted with the TVC engines at the time of the crash. No other Su-27Ms have been converted to Su-37 specifications, nor has the Su-37 design entered production. The Su-37 was never an official designation recognized by the Russian Air Force. The crash of 711 effectively means the end of the Su-37 as we have known since 1996. 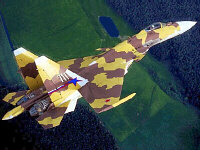 The possibility remains that the designation Su-37 will be re-used in the future for other Flanker derivatives. Reportedly, localized Su-35 (Su-27BM) airframes for the Russian Air Force will re-use the Su-37 designation.